Blood circulation is like gasoline in a car. If a car is low on gas, the car cannot operate fully. If blood circulation is poor in the body, then it cannot function properly. Blood circulation can be boosted naturally. Living an active lifestyle, not smoking, controlling underlying medical conditions, and above all, eating foods that are heart-friendly can all improve circulation. One food in particular that works wonders on your circulation — along with being known as a very popular aphrodisiac — are oysters. What makes oysters a circulation-boosting food is their high levels of essential fatty acids which can help promote good cholesterol and rid the body of bad cholesterol. The accumulation of bad cholesterol is a large contributor to poor blood circulation because it causes arteries to become thicker, narrow, and stiff. When this occurs, it puts added stress on the heart to compensate and try to pump out more blood. This increases the risk of a cardiovascular-related event. Another aspect of oysters that make them a great circulation food is their nutritional content. The nutrients in oysters have been found to reduce blood pressure along with relaxing blood vessels, which further reduces strain on the heart and allows blood to travel more freely. Oysters are also very high in iron, which is necessary for the development of red blood cells. When iron is low, you can suffer from anemia, which triggers fatigue, cognitive malfunction, stomach disorders, and general muscle weakness. When iron levels are healthy, there are ample red blood cells that can flow throughout the body. Each serving of oysters has over 90 percent of our daily recommended intake of iron. 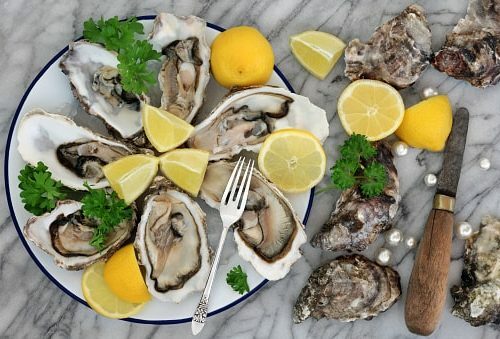 Aside from boosting blood circulation, oysters have been found beneficial for libido, healing, and boosting immune function all because of their nutritional content. If you’re looking for an all-around healthy food, oysters are a great go-to which can also offer several different health benefits.